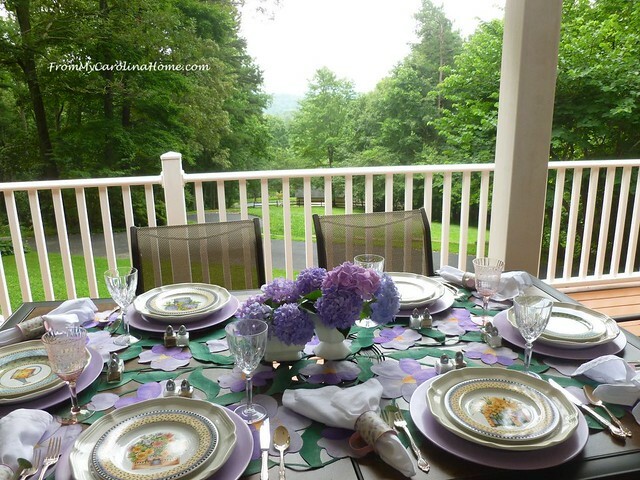 The heat is not quite as intense in the past few days, so of course I began thinking about having a luncheon with friends over to enjoy the veranda. There are several new additions to my tablescaping closet, some from thrift stores and some from online auctions I just could not resist. When I saw the plates, the whole table just came together. Having a meal outside is fun. Starting with the table runners, these were a real find!! 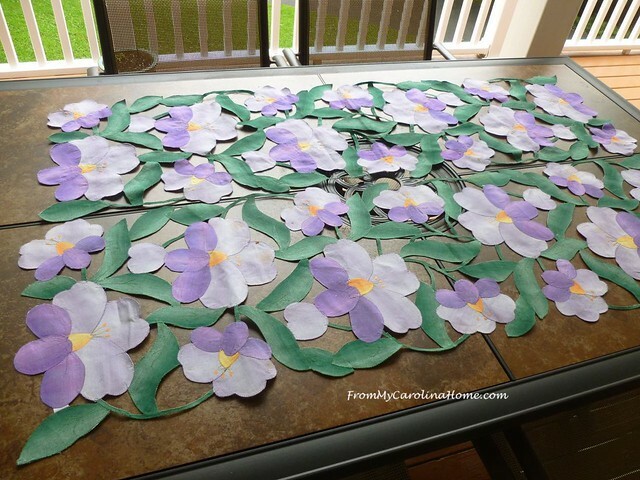 The lovely purple flowers and leaves are cut out, the pieces held together with stitching. I couldn’t find any lavender chargers, so I made some with thrift store ones. I’ve done this a couple of times now, you can see how I did some yellow ones here. Stoneware white dinner plates hold darling floral salad plates. Everyday flatware is added. Each salad plate is different. There are two different sets married together here as I needed six plates. I was able to get the set of four, then another two individually that worked together well. The watering can theme shows in the darling napkin rings with white napkins, so cute!! Wine glasses are added, and since I don’t have six of any one pattern, I used crystal ones on the sides and some pink Depression glass stems on each end. I like the mismatched look. Some of the plates have watering cans too. Individual salt and pepper shakers complete the outdoor settings. For the centerpiece, my hydrangeas are blooming in just the right colors. I gathered some milk glass vases and filled them up. In the end, I decided that the tall one in the middle was too tall, so it was placed to the side on a table next to the rocking chairs. The low centerpiece allows conversation over the top. So, hopefully we can enjoy a nice view on our luncheon day. and enjoy a special lunch. 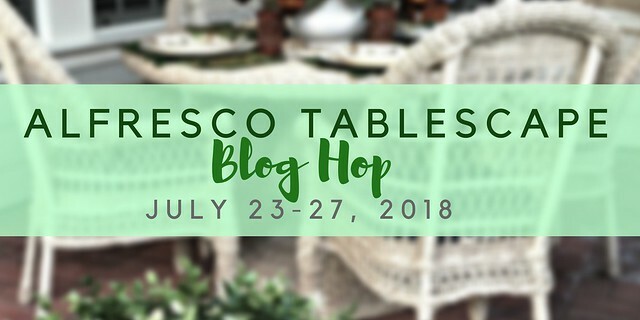 Thanks again to Chloe at Celebrate and Decorate who put together an Al Fresco Tablescapes Blog Hop! Enjoy more beautiful tables at these bloggers. Since this is the last day, all the links are live now. Craftsy has new Deals and Steals! See what’s new with my affiliate link! Do you enjoy dining outside? This is so lovely and inviting Carole!! Just gorgeous as always-you are so good with this talent. I especially love all the little details and those flowers sewn together-an awesome find. Carole, I love your porch setting. How nice for your luncheon friends. So clever to spray paint the chargers. Those table runners put together was clever and they made a delightful underpinning to your plate stack. Every detail is charming. The cute little napkin rings like watering cans are adorable as are the different salad plates. Your hydrangeas were a perfect centerpiece. I enjoyed your tablescape, Carole. Whoa, Carole, I don’t know exactly how much of that you were able to find thrifted, but it sure did come together beautifully! 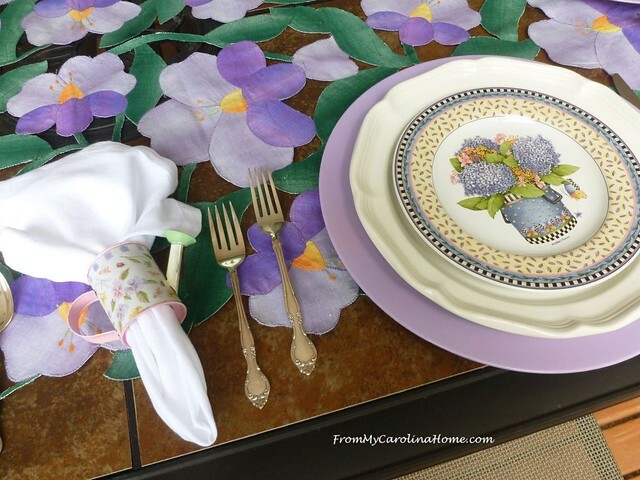 Those plates are adorable, the watering can napkin rings too, and that overlay on the table – do you think someone was going to applique a quilt and never finished? It’s so pretty. This definitely gives a cool feeling to an otherwise typically hot summer day. I’d really enjoy sitting there for a meal and watching the birds. Thanks for the invitation to your porch! wow! That runner is truly beautiful! 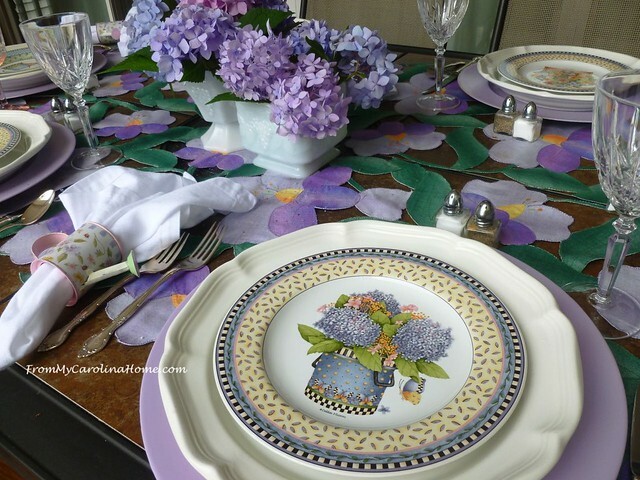 But after you added those lavender plates and hydrangeas, it became a show stopper! You did a lovely job! Oh goodness Carole, this is adorable!! Those runners are so unique and pretty, it was like they were made for your purple plates! The salad plates are fabulous, Mary Englebreit? Love them!! Your porch is beautiful, what a wonderful space to enjoy and your table is simply delightful! One of my favorites this hop!! The plates are Debbie Mumm for Sakura. that table runner — what a find! oh my goodness! Starting with that piece, everything else is just the icing on top. You’ve created a delightful little tablescape for your friend luncheon. I hope it was an afternoon well spent. Enjoy the rest of your summer. 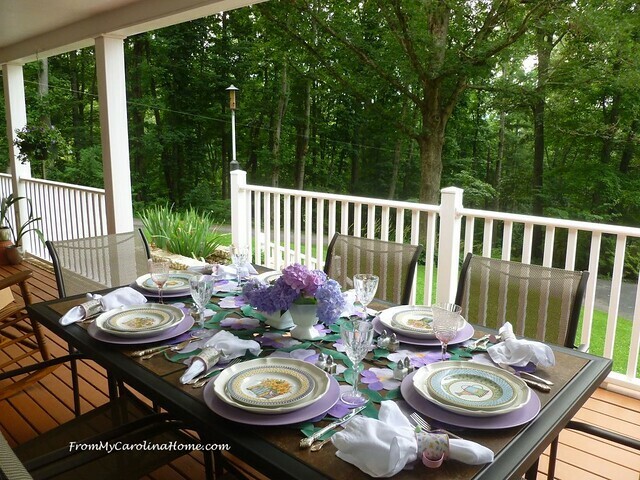 love love love your lavender tablescape Carole…you have such a beautiful view from your porch and I know your luncheon was amazing. The table runners are a perfect find. It is always fun to blog hop with you. Very pretty table Carole. Great job on the thrifting. 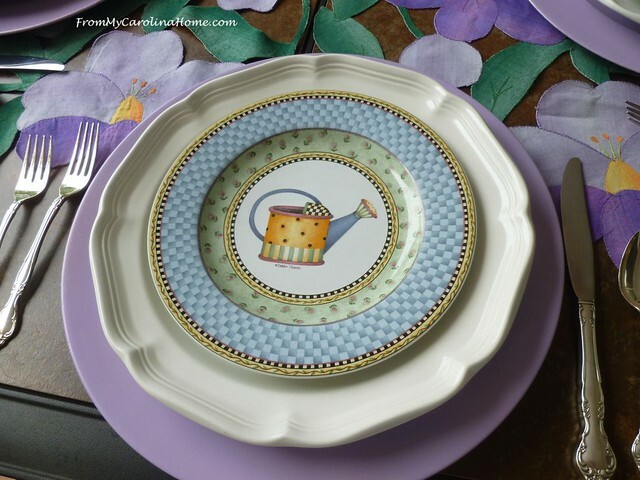 Lavender is so pretty and those garden plates are adorable. 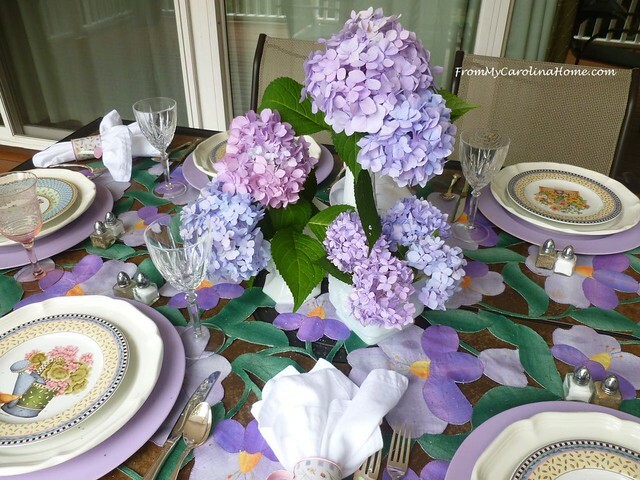 Carole, love the lavender and green color scheme and how the table runner and hydrangeas fit together so well. The salad plates are so cute. The idea of painting old chargers is brilliant. Will have to keep that in mind. You need a Spray Shelter for spray painting! That runner is amazing! I am so impressed with it! I have painted my own chargers in the past, myself. Those plates are so beautiful and I love the little detail on those watering can napkin rings. 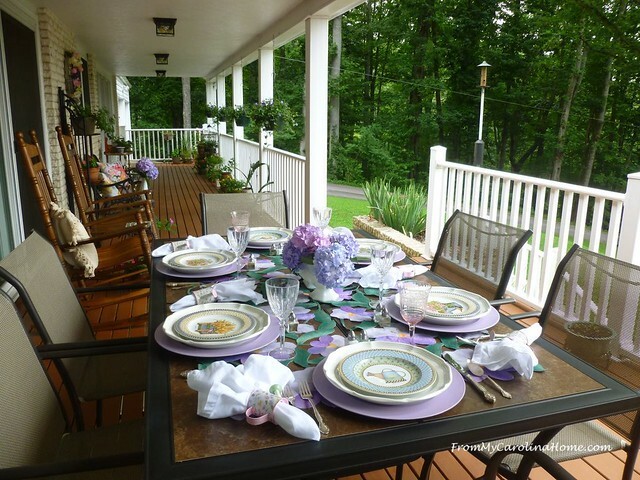 I am sure that anyone would enjoy joining you for a meal at this pretty table on your porch! 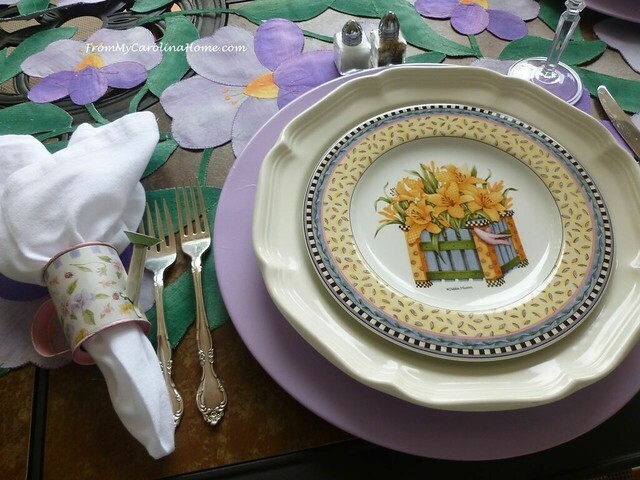 Thank you so much for sharing your table styling talents for another tablescape blog hop! Carole, what a find on the runner. 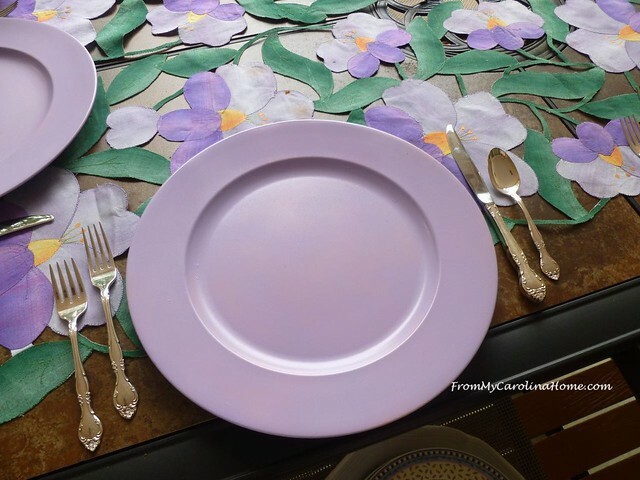 I love the lavender theme and the salad plates are perfect and so unique. I have never seem the pattern and wow the cute napkin rings added more pretty detail. Your porch is the perfect setting for lunching alfresco. It has been fun blog hopping with you this week. 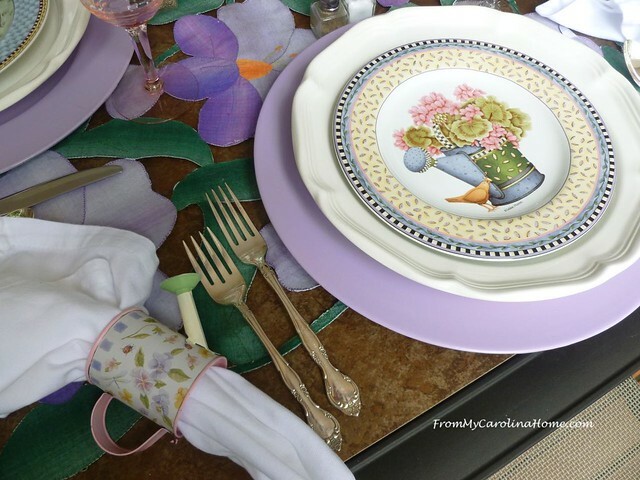 Fantastic Al Fresco Tablescape and in one on my favorite colors. Love all the purple and lavender colors and the little plates with the watering cans baskets of flowers are so precious. The table runner is so appropriate and suits all the colors in the plates. 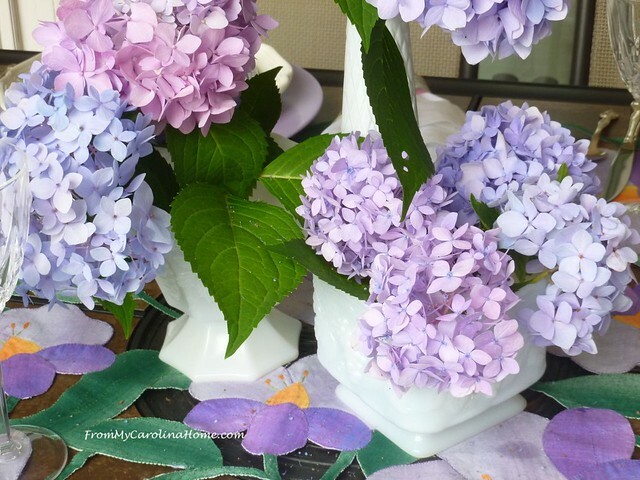 The Hydrangeas are the perfect flower and the watering can napkin rings are the tops! I would have wanted to watch the birds had I been there. How did you make the charger plates? Did you paint them on the back with a special paint or decoupage them? Really liked the white dishes and flower holder. Have been looking for some special white pieces to use to make a floor stand holder to put a plant on in my den, have gotten into some of this yard art with dishes, punch bowls to use as planters and decorate with. How in the world do you manage to store all these wonderful pieces you have? I know you have to have a filing system as to where all the special pieces are at don’t you. Have a great weekend. First of all, I LOVE your porch!! Beautiful table runners!! I also love the lavender chargers! Great idea!! And those salad plates are just darling!! 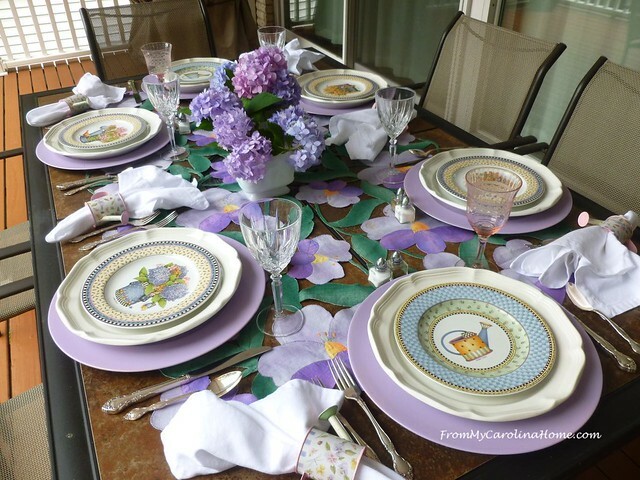 Hello Carole; Your table setting is take my breath away delightful! Purple has always been my favorite color and with each item you shared, I was dreaming! Your superb ability to work with colors and patterns always leads to a gorgeous setting. Yet, it always feels welcoming where (at least from this point of view) you are not afraid to pick up individual pieces and admire them. Thank you once again for inspiring me with ideas and reaching out to try new ideas also! Have a marvelous luncheon with your friends! I love your colors in this table scape. I look at the thrift store all the time and have yet to find anything to make a cute Tablescape. I’ll keep looking though. You inspire me, Carole!! Carole, OMG the table runner is to die for, as are those adorable watering can napkin rings. Love the cool color palette which perfectly matches the beautiful blooms. Such a beautiful table scape. The salad plates are so lovely that my face lit up with an “oh my” and a smile when I saw them. Always so pretty…thank you for sharing such grace and beauty on your blog. I am going to have a look at the others! What a wonderful and unique table cloth you found! I’ve never seen anything close to that. Your hydrangeas are just perfect for this setting, I hope you enjoy your luncheon with friends. I adore your Debbie Mumm salad plates!!! I have always been a big fan of her artwork and have made several pieces from her fabric line. I think I may even have some of the sprinkling can fabric still left in my stash, so those cute little sprinkling can napkin rings really tug at my heart as well. What a pretty table in a pretty backyard setting – perfect for friends to enjoy a lunch! This is such a beautiful table! I love all the purple accents and your hydrangeas are gorgeous! 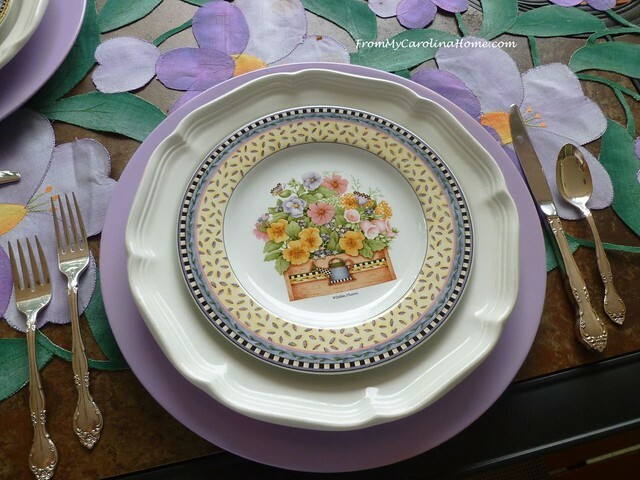 I am swooning over those pretty salad plates! Adorable salad plates Carole, I can see why you couldn’t resist them! 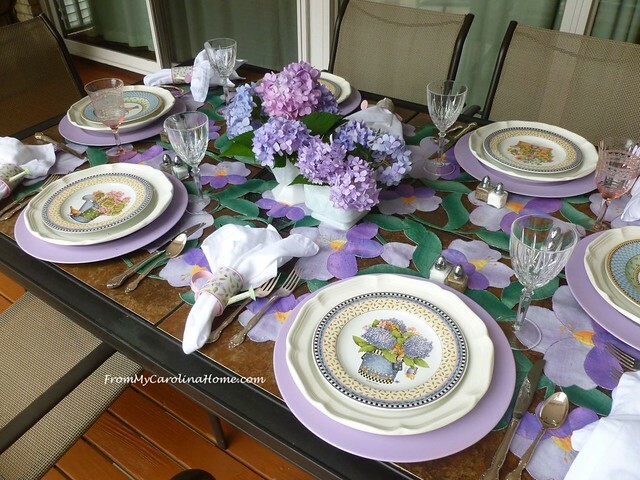 The table is perfect for alfresco dining set on your pretty floral runner with your hydrangeas. It’s always a pleasure to blog hop with you! 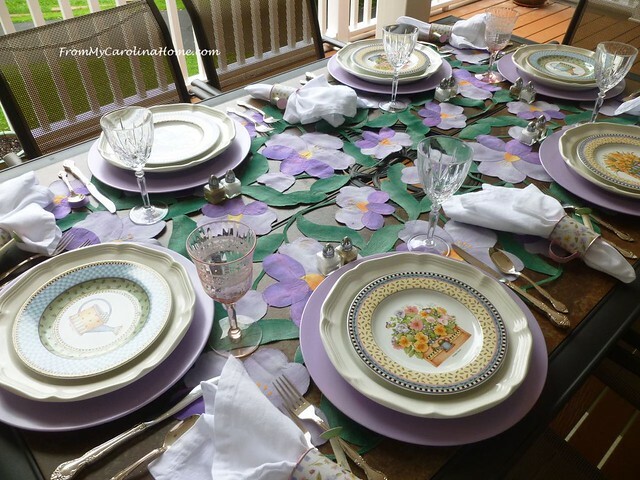 Carole, such a pretty summer table! I really love that runner and all the detail! Your salad plates are so cute and reminiscent of the garden in the summer time! I had never thought of painting chargers from the thrift store. Thanks for the tip! Such lovely lavender hues on your front porch. This is perfection for a Summer day. So sweet, inviting, pleasant and welcoming. I do believe this would be utopia for me, especially since I live in Texas.